J.W. Mason kicked off the latest skirmish in the never-ending macro wars with his Jacobin article "A Demystifying Decade for Economics." (Note: at the time of writing, the article was taken down until its publication in Jacobin.) This prompted a Twitter debate about representative agent macro, which eventually led to this Beatrice Cherrier article on heterogeneous agent models. In my view, the debate about representative agent models is a red herring. Mainstream macroeconomists main skill is in framing debates in a fashion that is congenial to the mainstream; however, the preferred framing leads to dead ends. My current research focus is on recessions, and although I have not gone too far in refreshing my survey of mainstream macro, the value of mainstream macro theory in this debate is limited. The intellectual dead end created by the usual framing of mainstream macro is straightforward. Some heterodox economist argues that "mainstream models" are useless because they have property x. This then leads to mainstream economists pointing out that models U, V, W that do not have property x. The problem is that models U, V, W have property y instead -- which makes them also useless from a practical standpoint. This debate never ends. What we need to ask ourselves: why would we use these models in the first place? The usual defence is that the mathematical formalism provides a coherent way of looking at problems. The problem is that each model is essentially a crippled model of a toy economy that offers some particular insight. For example, we can use a model to argue "fiscal policy is effective at the zero lower bound" -- but for any other purpose, the model is useless. The problem is that we face hundreds, if not thousands of these toy models, and they all offer contradictory advice. We need to distinguish between "mainstream" economic theory versus empirical work. The empirical research produced by mainstream economists cannot be treated as interchangeable with mainstream theory (even though mainstream economists assert that this is what we should do). 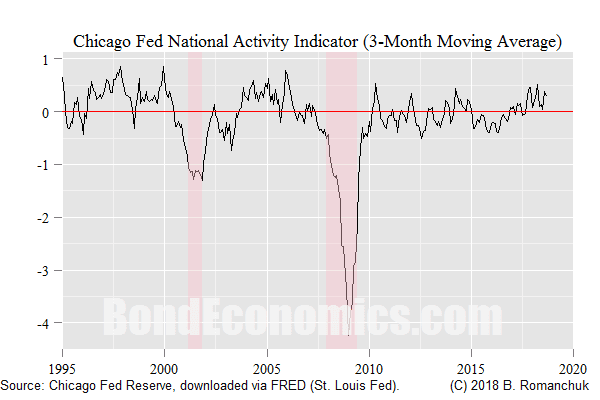 I will take as an example the National Activity Indicator produced by the Chicago Fed. I discussed this indicator at greater length in an earlier article, although I am somewhat cautious about it, it certainly represents a serious analytical effort. To summarise its construction, it is the underlying tendency (the first principal component) of a number of economic time series. It acts to summarise the state of the business cycle. No matter how we view the quality of this indicator, it is clear that it is independent of mainstream economic theory. Any class of economic models that result in an aggregate business cycle would suggest that the first principal component of "cyclical" economic time series would act as a good summary indicator. That is, such empirical models can be generated by any school of economic thought. Although heterodox economists are smeared as being anti-mathematics, heterodox economics conferences feature empirical research presentations that are just as boring as those at mainstream economic conferences. Using pre-2008 DSGE models, the standard story was that business cycle fluctuations are caused by "unforecastable" random disturbances that hit the economy (such as "productivity shocks"). These shocks drive the economy away from a "full employment" "equilibrium." From this standpoint, recession forecasting is expected to be very difficult by definition: since the shocks are unforecastable, so are recessions. All we can hope is that a monetary policy rule (before 2008, it was almost always a monetary policy rule) can minimise the effects of such shocks. The 2008 Financial Crisis was just a really unlucky roll of the shock dice. Since I am skeptical about the forecastability of recessions (for other reasons), I cannot argue too strongly against that conclusion. Instead, my concerns lie in how the conclusions are arrived at. Falsifiability. If all business activity is just the result of random disturbances, how do we know the models are valid? How plausible are these shocks? The "external shock" formalism was stolen from control systems engineering. In control engineering, external shocks are part of life; planes are hit by gusts of wind, wires have high frequency signals induced by radio frequency electromagnetic pollution, etc. This makes sense, since most engineering systems are very small relative to the world they operate in. However, macro models are supposed to encompass the whole economy. Where are these "external" shocks coming from? If they are shifts to preferences, how plausible are those shifts? Needless to say, I am skeptical about mainstream macro theory. That said, I want to give a fair treatment to the topic in my recession work, so I want to avoid digging in to extreme positions before I do a refresher survey. (I am most familiar with the pre-2008 literature; I see a lot of similarities in the post-2008 literature, but I will need to dig deeper.) In any event, I will probably spend far more time on empirical work, which will cover both the heterodox and mainstream literature. The shocks in DSGE could be changes in beliefs, as new evidence confirms / disconfirms previous expectations. That seems reasonable. Sure, my wording here is not the greatest. Once you log-linearise the model, the shocks look exactly like external disturbances in control systems models, although they are internal to the non-linear model. The issue is whether we behavioural changes of the types suggested with a sufficient magnitude to cause the recession. This was an angle that came to me just as I was finishing off the article, and need to think about it further. The problem is that each model has its own set of shocks. Even if I point out that a certain model’s specification of the shock is implausible, people could object that another model has a different shock specification. These models are being created faster than I can read them, so I am not going to go down that rabbit hole.